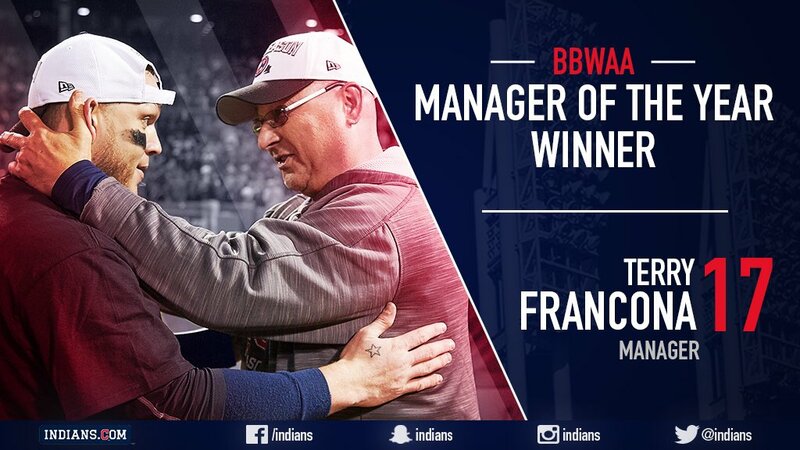 All Things Brantley, All Things Tribe: Terry Francona Wins BBWAA's 2016 AL Manager of the Year Award! Terry Francona Wins BBWAA's 2016 AL Manager of the Year Award! today, on November 15, it was announced that Terry Francona won Baseball Writers' Association of America's 2016 American League Manager of the Year Award! 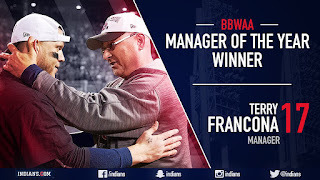 this is Francona's second MOY award while with the Indians, as he previously won it in his first year managing the club in 2013. the only other Indians skipper in franchise history to win Manager of the Year is Eric Wedge (2007). congratulations, Tito! 22 of 30 total 1st place votes and won the award by 64 points. the voting goes like this. two writers in each American League city cast their ballots for this award prior to the commencement of the postseason. all the votes are tallied and the person with the most number of points wins. a 1st place vote is worth 5 points, 2nd place is worth 3, and 3rd place is worth 1. Francona was the only manager to appear in the top 3 on every individual ballot. Chris Assenheimer of the Chronicle-Telegram and Ryan Lewis of the Akron Beacon Journal were Cleveland's media voters for this award and, of course, they voted for Tito. to see all the individual ballots, click here. Francona's expertise led the Indians to their first AL Central Division title since 2007, a 94-67 win-loss record, and their first World Series appearance since 1997. Banister's Rangers finished first in the AL West Division (for the second straight season) with a 95-67 record, but were eliminated in their American League Division Series versus the Toronto Blue Jays. Showalter's Orioles nabbed the second AL Wild Card spot with their 89-73 record, but lost to the Blue Jays in the wild card playoff game. this year, the Indians put together a 14-game win streak from June 17 - July 1 and never lost more than three straight games at any point in the season. the fact that the Tribe did so well without their best hitter in Michael Brantley makes what the team accomplished in 2016 all the more impressive. "i'm honored. i'm incredibly honored, but i'm actually uncomfortable," Francona said after his win (via video on indians.com). "when there's awards, i want it to be for our players. but it also does give me a chance to brag about our guys. when something like this happens, if somebody thinks it's an individual award, it's the furthest thing from the truth. one, it's players, incredible players. it's front office, ownership. it's the coaches. the coaches, they work so hard every day and i'm the one that gets to take a bow every once in a while. and i wish we could do this together because they deserve it. they're so deserving." "i think it's pretty evident that i love where i work and who i work for and with," he expressed. "we also had a really special team. and i think sometimes you can miss out on, waiting til the end to see, like, somebody will say, 'hey, when did you know your team's special?' wait a minute. sometimes things happen and you don't win, but it doesn't mean teams aren't special. and you're darn right i wanted to enjoy 'em. and for the most part, it was really fun showing up to the ballpark with this group and i didn't not want to enjoy it. "we tried so hard to stay in the moment. and there's a reason. it's not just coach or manager talk, or cliche, but it's because we believe in it. if you let the past beat at you, you get a hangover. if you look too far ahead, you can miss what's right in front of you, and it can look kind of daunting. but when you just try to show up and think, 'ok, we just need to be one run better today,' it seems a heck of a lot easier. and then, you do that well enough and all the sudden people are starting to talk about what a good team you have." "i think anybody who spent five minutes with me could tell how much i enjoyed this club, not just trying to get the final out, but the actual journey itself," Tito remarked in Jason Beck's article on indians.com. "doing it with this team, this organization, the people i work for and work with, it's so incredibly fulfilling. you never want to downplay when you win, because it's so hard to do, but it was an incredibly fulfilling year. "i think that i'm really unbelievably fortunate to be where i'm at in baseball. i enjoy managing so much." Chris Antonetti, Indians President of Baseball Operations, issued this statement following Francona's win: "although Tito never seeks individual attention or recognition, it's great to see his extraordinary work honored with the AL Manager of the Year Award. Tito has done a remarkable job in leading our Major League team during his four seasons with us and has been an instrumental part of any organizational success we've achieved, however, focusing on only those achievements would understate the impact he's had on the entirety of the organization. his passion, work ethic, determination, collaboration, humility and team-first approach represent the values we aspire to embody throughout the organization." here's to a speedy recovery, Tito, and congrats again on your award!